Planning to join us for the KAFP Annual Meeting: 70 Years Caring for Kansans? The conference hotel deadline is quickly approaching! Reserve your room at the Overland Park Marriott Hotel for the reduced rate of $129.00 + taxes and fees. This special reduced rate is available until Friday, May 25, 2018. To make your reservation please call the Marriott at 913-451-8000 and request the ‘Kansas Family Physicians’ group rate. There is still time to register. Please join us June 14-16, 2018 in Overland Park, Kansas for our biggest event of the year. We are pleased to offer a Pre-Conference Knowledge Self Assessment (KSA) on Health Behavior – Wednesday, June 13 from 1:30 – 5:00 p.m. (8 CME credits.) Register TODAY! Please contact the KAFP office at 316-721-9005 or email kafp@kafponline.org with questions about the meeting or registration. We hope you will attend and celebrate 70 Years of Caring for Kansans! This live activity, KAFP 2018 Annual Meeting, with a beginning date of June 14, 2018, has been reviewed and is acceptable for up to 15.75 Prescribed credits by the American Academy of Family Physicians. Physicians should claim only the credit commensurate with the extent of their participation in the activity. 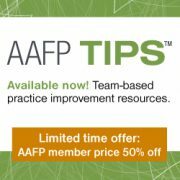 The American Academy of Family Physicians is proud to introduce AAFP TIPS, a Transformation in Practice Series, featuring ready-to-use practice improvement tools and training for family medicine teams. Two topics are now available: Empanelment and Quality Improvement. Whether you are trying to implement medical home functions, streamline processes, or enhance the patient experience, AAFP TIPS makes practice improvement faster and easier. And right now, AAFP members can try these courses for half price. The team-based training is designed specifically for family medicine and includes practical, customizable tools plus instructional videos that will help you make improvements right away. Learn more. While the research value of appending community characteristics to the clinical record is well established in academic literature, it’s equally important to be able to summarize this information in a practical and actionable way that can be integrated into clinical practice. HealthLandscape’s goal is to advance the science of integrating social determinants of health (SDoH) into clinical practice. The Community Vital Signs application suite is part of that ongoing effort. The Population Health Profiler is designed to demonstrate the ease of using SDoH for health and well-being. The tool lets users create detailed ZIP code/ZCTA level maps of their service area and key community measures as well as download a detailed report of 30 key measures in the areas of basic demographics, social determinants of health, chronic conditions, and access to care. Access the tool and sign up for a webinar for more detailed training at www.healthlandscape.org/CVSProfiler. This week in our tour of the KAFP website we will explore the About Us section. On the About Us landing page you can find the KAFP mission statement, vision, leadership, and history, including a link to past presidents! Contact KAFP provides the various ways to contact your Academy: Mail, phone, email, fax, social media. KAFP Team is a listing of staff and methods of contacting each of us. Board of Directors is a listing of officers, AAFP delegates & alternates, KAFP-Foundation president, district directors, faculty/student representatives, committee chairs, and each of our residency programs. We thank each of them for serving on the board. 2018 Board Candidates: A list of candidates running for election this year with their pictures and candidates’ statements. Remember: district director ballots are due May 15! Districts: A state map showing the geographical location of each of the KAFP districts and district counties. Committees: Committees’ purposes and members are listed. Committee applications coming soon! President’s Corner: Features the President’s Letter is printed in the Kansas Family Physician. Kansas Family Physician: Current and past issues of the KFP. Check out the latest spring issue! KAFP Weekly: Current and past articles in the e-newsletter. Newsroom: News releases and media inquiries. 70th Anniversary: A special page dedicated to showcasing the last 70 years! Check out the following: Through the Years, Your EVP’s Perspective, Throwback Thursday and AAFP 70 Years Strong. https://kafponline.org/wp-content/uploads/2018/01/KSSPTG_web_large.png 0 0 Marina https://kafponline.org/wp-content/uploads/2018/01/KSSPTG_web_large.png Marina2018-05-07 17:57:472018-05-07 21:41:11Visit KAFP Website's "About Us"
Happy Birthday to KAFP, chartered May 6, 1948! On our 70th anniversary we take time reflect on our rich history and see how far we have come for our patients, our communities, the state of Kansas, and our specialty. Today, family medicine plays a vital role in the health of current and future generations. Here’s to the next 70 years of caring for Kansans! Visit our 70th Anniversary web page for more memories or share your memories on social media with #KAFP70Years. And if you have not already, register to join us at the 2018 Annual Meeting – June 14-16 – to celebrate! Your jurisdiction’s HPV vaccination report is now available. View December 2017 report. View May 2018 report. These reports highlight your jurisdiction’s HPV–associated cancer burden in addition to distribution data for all CDC and non-CDC distributed Gardasil 9 vaccines for 2017. Please see below for more information on how to interpret the vaccine distribution data. . If you have any questions, please contact hpvquarterlyreport@cdc.gov. The graph on the front page of the HPV Vaccination Report indicates your jurisdiction’s progress towards a “goal” of distributing enough HPV vaccine to immunize the estimated total number of 11-year-olds in your jurisdiction. The 2015 US Census and American Community Survey were used to obtain the population estimate of 11-year-olds in your jurisdiction. Based on this estimate, CDC was able to calculate the number of doses needed to immunize this cohort in your state or city with 2 doses of vaccine. Historically in the United States, 20 percent of annual HPV vaccine doses have been distributed in the first quarter, 20 percent in the second quarter, 35 percent in the third quarter, and 25 percent in the fourth quarter. These are the benchmarks used to measure your jurisdiction’s progress each quarter. The gold arrow indicates your jurisdiction’s ordering trend last year and its progress towards distributing 100 percent of its estimated HPV vaccine doses in 2017. Data presented in this report includes all CDC and non-CDC HPV vaccine orders. Although the number of doses needed to vaccinate your 11-year-old cohort is estimated, doses that were distributed in 2017 may have been administered to individuals between the ages of 9 and 26 years. Bullying. Concussions. Opioid abuse. These are just a few topics family physicians discuss with their patients every day. While most family physicians feel comfortable talking about these subjects, patients may be less at ease, especially if they have experienced one of these issues first-hand. To help patients prepare for these conversations, the AAFP has launched a national public service announcement (PSA) campaign. An important aspect of the campaign is to educate patients about pertinent public health issues, and to encourage them to visit familydoctor.org the Academy’s patient-focused website, for more information. The AAFP will release a new PSA on the first of the month from May through November. May is mental and emotional health (e.g. bullying). November: addiction and recovery (e.g., opioid abuse and safe medication storage). KAFP will share and post the PSAs on social media. We encourage you to share these PSA’s on social media, and to follow familydoctor.org on Facebook and Twitter. Ultimately, it is important that patients, after viewing the PSAs, will gain a sense of empowerment over their own health. Increasing patients’ knowledge of important health issues that affect them is intended to help them feel more prepared and willing to talk about them with YOU – their family physician. 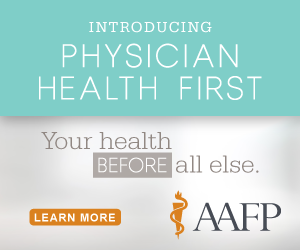 Physician Health First is a web portal dedicated to improving family physician well-being. Find guidance to address your workplace challenges, tools to assess your level of burnout, and inspiration to put your well-being first. Learn more. Use Population Health Profiler for Free Today! Check out these free resources that enable health care providers to explore a community’s social determinants of health and target core service areas defined by a specific patient distribution.​ Click here to try the The Population Health Profiler! The Population Health Profiler lets you create detailed ZIP Code/ZCTA level maps of your service area and key community measures including the distribution of age, ethnicity, social deprivation, and chronic conditions. https://kafponline.org/wp-content/uploads/2018/01/KSSPTG_web_large.png 0 0 Marina https://kafponline.org/wp-content/uploads/2018/01/KSSPTG_web_large.png Marina2018-05-07 15:00:342018-05-07 17:29:58Use Population Health Profiler for Free Today!